"Terrace on the Archaeological Park"
Property 9: "Terrace on the Archaeological Park"
Terrace On the Park - "Carretteria"
Property 30: Terrace On the Park - "Carretteria"
Property 31: Terrace On the Park - "Carretteria"
Villa with swimming pool "Il Grande Ulivo"
Property 36: Villa with swimming pool "Il Grande Ulivo"
Property 38: Le Cabanon, Guest House. Lovely country setting in a charming stone house. We thoroughly enjoyed this stone cottage in the country. It is spacious well equipped with everything needed, and very comfortable. The house was clean and with good instructions for anything a guest might need. We loved the shaded patio, and the pellet stove provided a welcome heat source on cool nights. The location is great if you have a car, with access to the fascinating archaeological sites of Ispica Park, and beautiful Centro Modica. Alberto and Marcello are quality hosts, very responsive. Highly recommended. 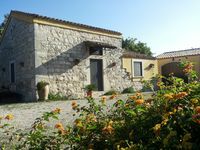 Tucked just above Noto Antica, this is a lovely old family farmhouse. The accommodation is simple, but comfortable, consisting of 2 bedrooms (with comfortable beds), bathroom and well equipped kitchen, with adjoining washing room. The sitting area is outside, a covered terrace with tables and chairs. There is also WiFi, and air conditioning if needed. The acommodation adjoins the Borgo Alveira agriturismo, but nothing disturbs the tranquility and peaceful location. Ernesto, the very helpful owner, was born on the farm, and he clearly loves it as a second home away from the city. Our flight was delayed, and Ernesto very kindly offered to get some provisions for us, and met us just outside Noto to show us the way, which would not have been easy in the dark! He told us about local village shops, and places to go,, and was readily on hand to sort out any problems that may arise. The house is about 10 minutes from the Noto to Palazollo Acreide road, a few hundred yards above the entrance to Noto Antica, a very atmospheric place to wander around, and explore the river valley with its old mills, tanneries and rock pools, perfect for a swim on a hot day. Noto itself is 15-20 minutes away, a lovely baroque city, with many good restaurants and bars selling amazing granitas. We recommend the gelsi nero (mulberry) flavour, something we have never tasted outside Sicily, and is wonderful. Siracuse, Ragusa, Scicli, Modica and Palazollo Acreide are all easy to get to, as is the lovely coastal natural reserve of Vendicari. 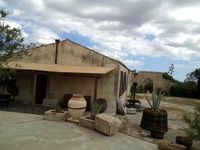 We enjoyed visiting Marzamemi, and also Punta Secca ( famous for being the setting of Montalbano's seaside home), the nearby Villa Romana del Tellaro (lovely mosaics) and the Cava Grande del Cassibile. Everything within an easy drive, and through some beautiful countryside. All in all, an excellent base from which to explore the south east of Sicily.